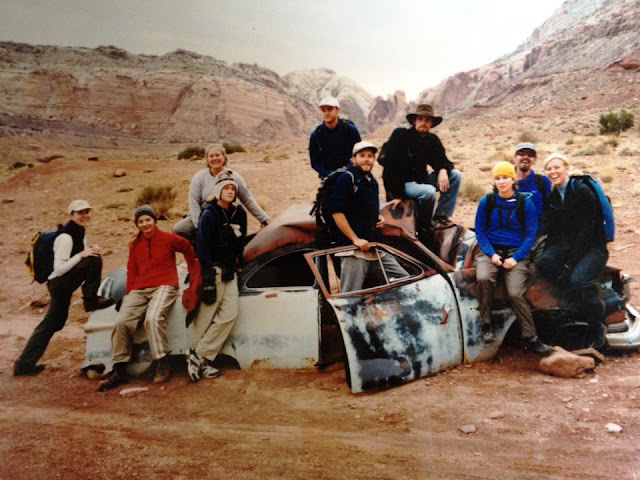 Every couple of years, a group of friends from college plan a reunion in the Utah desert. For various reasons I missed the last two, so it had been six years since I've seen many of them. I suppose it's an anomaly that we bother to get together at all, but we all agree that life would be more dull without the "Terra Firma" crew on the periphery. Terra Firma was the name of an conservationist club at the University of Utah. On a whim I walked into a meeting one afternoon in 1998. 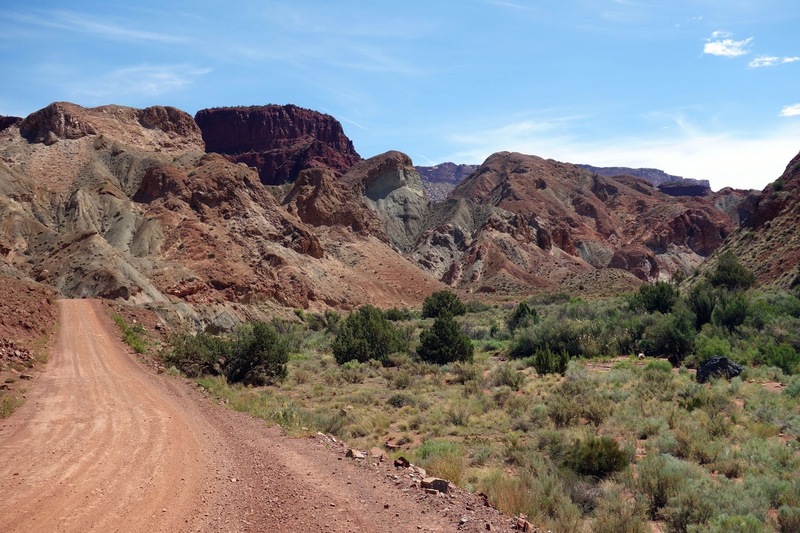 That weekend, I joined an eccentric but entertaining crew on a camping trip in the San Rafael Swell — to document illegal ORV use, of course. And also adventure in the desert. My life has not been the same since. Here some of us are in October 2002, about to drop into Quandary Canyon. At this point I was co-living with nine other folks in one four-bedroom house (we called it the "Terra Firma Commune." But we weren't cultish, just cheap.) Every weekend we were traveling, to the desert or the mountains, to camp and hike. At that point in my 20s I had become world-weary, with a demanding job, a long commute, a few more career ambitions and a mountain of fears. This photo of Quandary Canyon always makes me smile, because I remember exactly how I felt in that moment. I was not happy we were about to descend into a scary slot canyon. I was anxious and terrified and probably would not have subjected myself to such misery had I not been so influenced by my friends. Sometimes I imagine what my life might be like had I never met them. 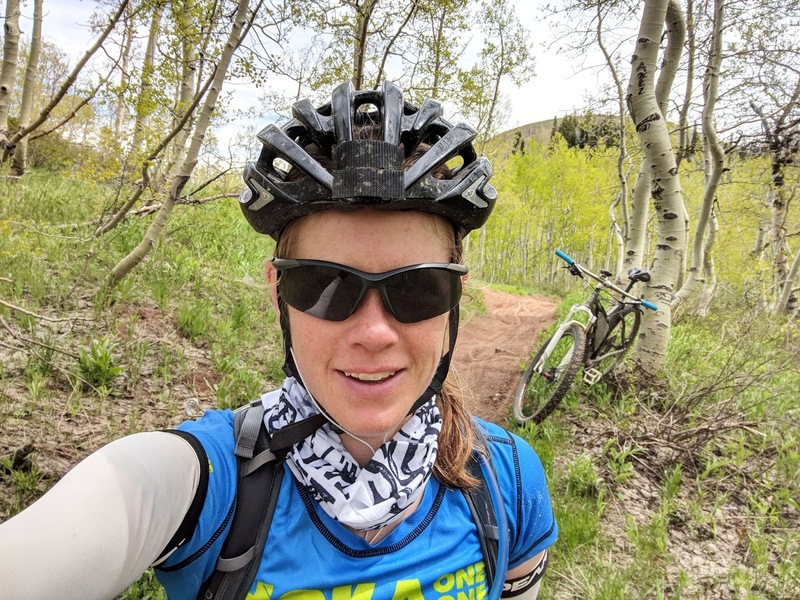 I probably would have followed the neurotic inclinations of my young adulthood into a stressful work life and damaging addictions (I mean more damaging than cycling and running.) I'm endlessly grateful for the folks who dragged me — often kicking and screaming — into the world of outdoor adventure. Now we're all near or over 40, with a lot of children in the mix. 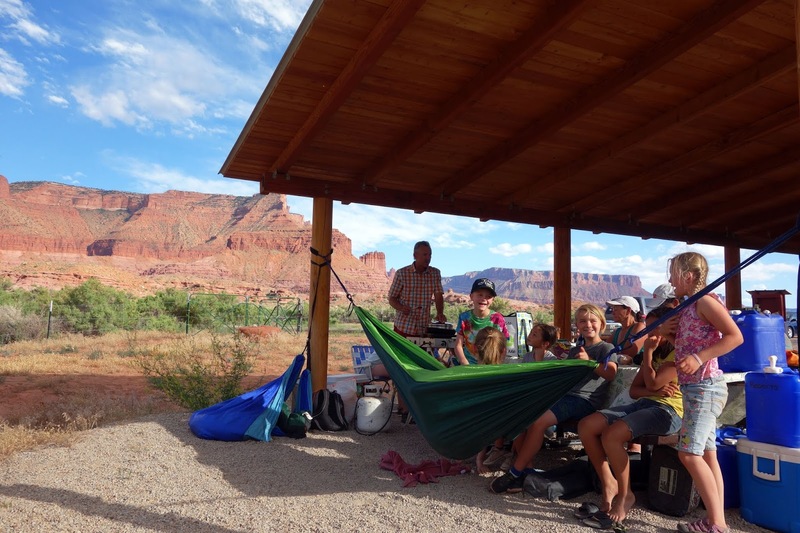 For that reason we reserved a family-friendly group site along the Colorado River north of Moab. I arrived Saturday evening — having purposely shown up a day late to skip the group river trip — to a temperature of 95 degrees with high winds. The camp site looked like an abandoned war zone — overturned and collapsed tents, tarps tangled in the tamarisk, everything covered in sand. The group of nearly 40 adults and children returned after battling the wind for more than nine hours. Everyone was fried, but we still sat down in sun-faded camp chairs and picked up where we left off ... has it really been six years? Or 20 for that matter? It feels like we were doing this last weekend. 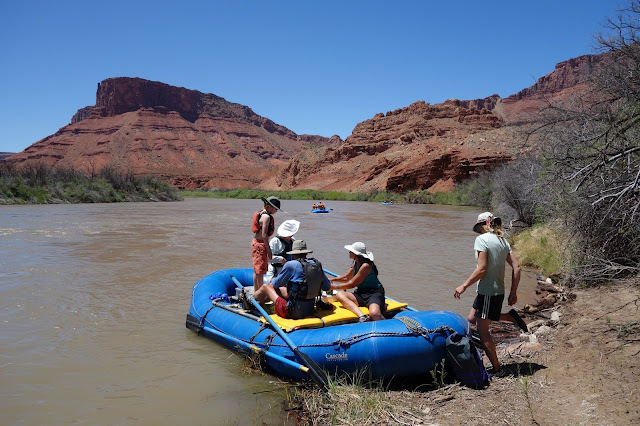 On Sunday, against all of my current neurotic inclinations, I was coerced into joining a smaller crew who hadn't tired of river rafting after nine grueling hours the previous day. They were day-tripping a segment of the Colorado River known as the Moab Daily, with incredible scenery and a few small rapids. Although my early adventures with the Terra Firma crew stoked many of my passions, I also picked up a few abiding phobias. To this day I am terrified of moving water, to the point that I start having mild panic attacks and my mind goes blank and I make bad decisions. It's difficult to explain this phobia to people who know me as "the crazy one who rides bikes across Alaska." They assume I must be fearless. They couldn't be more wrong. So I have to retell my harrowing stories, even to friends who were there for the mishaps. They agree my fears are justified. Still, I *know* that the Moab Daily is a non-issue, and also that several 2-year-olds had managed the trip the previous day. I relented. My friend Craig joked that I had been "baby-shamed" into going on a rafting trip. 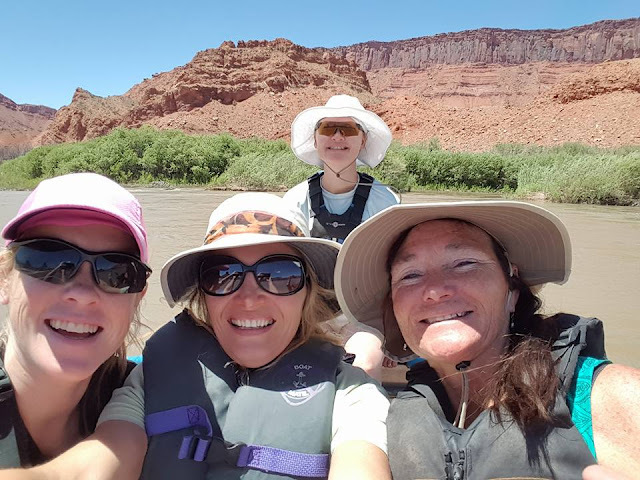 The Moab Daily was fun — really, this is the best way to spend a day in the desert when temperatures are in the 90s. I also can't deny that my heart was racing and my peripheral vision began to darken every time the enormous raft rolled over tiny riffles. It was a struggle to hold it together. I had to focus on my breathing. What is wrong with me? During the last rapid, Chris was rowing and asked everyone if we wanted to hit the big hole. I said nothing, but admitted to the crew that I was going to duck into the bow for this one. The raft dove in and the nose hit bottom, plunging me briefly into a caldron of water and causing the rear of the raft to fold over. Micah was thrown into the dry box and badly bruised her shin. An attachment to the oar lock broke, and Chris urged me to unhook the spare oar quickly. So I had to hang over the side of the boat, watching whitewater rush by my face as I fiddled with buckles and straps in a situation that felt urgent. Although this confession will invite more justified baby-shaming, I'm actually really proud of myself that I held it together and didn't black out, the way I did on an ill-advised "I'm going to be brave before the Tour Divide" Westwater rafting trip in 2009. But this trip did show that my phobia has not improved much since then. There won't be any packrafting in my near future, at least not before therapy. When we told the story of our Moab Daily incident around camp, Craig said, "It's always you." I was feeling a bit rough — maybe too much time in the sun? 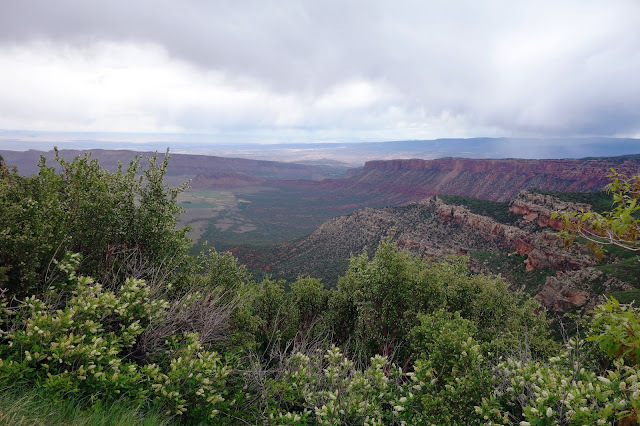 — but enjoyed the steep struggle spin up to Polar Mesa. 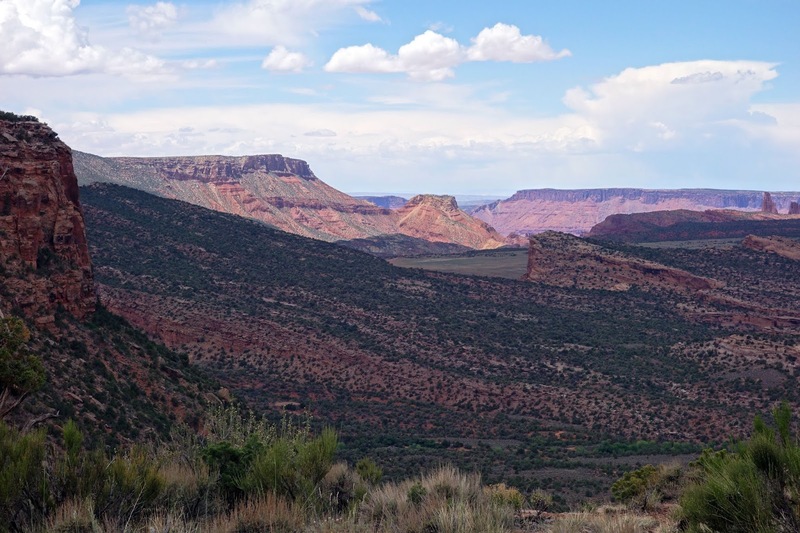 The views from the rim are always worth it. I'd been away from Internet and cell phone reception for two days — pure bliss — so hadn't checked recent weather reports. I assumed it would be mid-90s and breezy like the previous two days, so I packed four liters of water, some snacks, and not much else. Temps were coolish for my 10 a.m. start, and then dark clouds moved in. 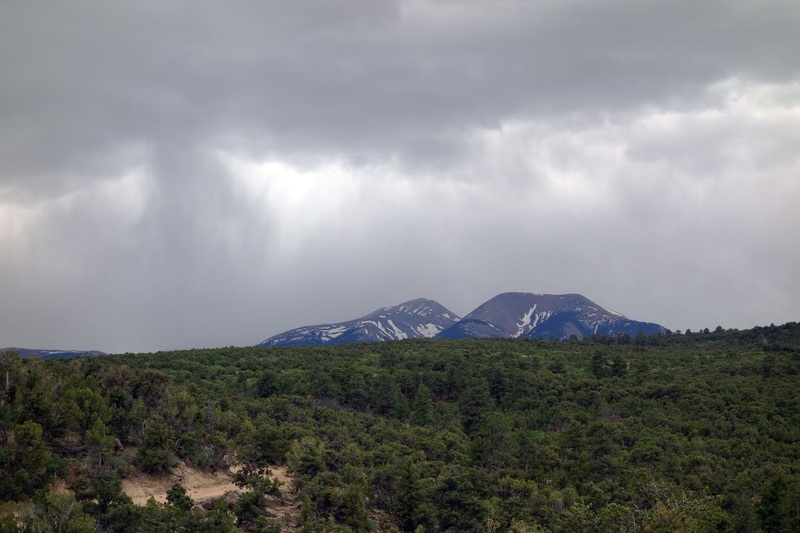 Sprinkling rain brought drenching rain and then, near 8,000 feet, a fierce hail storm. I bundled up in my 2-ounce wind shell, pulled my buff over my head, and huddled under a pine tree. 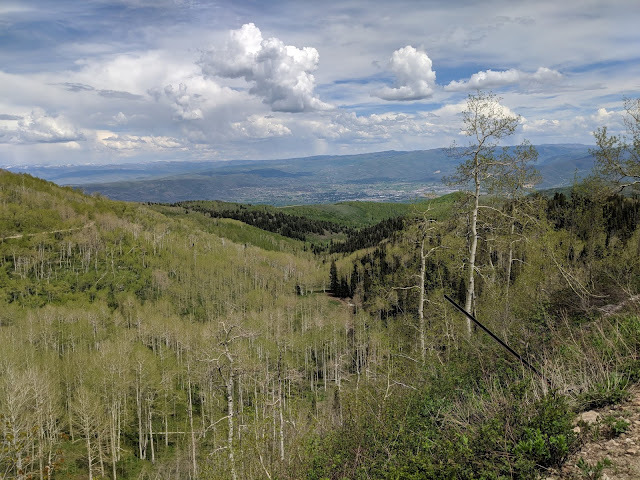 As my core temperature trickled downward, I decided it was better to keep moving by climbing upward rather than retreat on a 12-mile rolling descent. So I kept pedaling into the storm, shivering, and a little bit frightened. This I had not expected. The storm moved on and the temperature shot upward — back to being almost hot and humid. Early summer in the desert. I should know better. I should also prepare better. I know this. The Castle Valley connection provided a nice opportunity to unravel five hours of straining, shivering effort by coasting nearly the same distance in one hour, back to sunshine and the highway. Pure bliss. 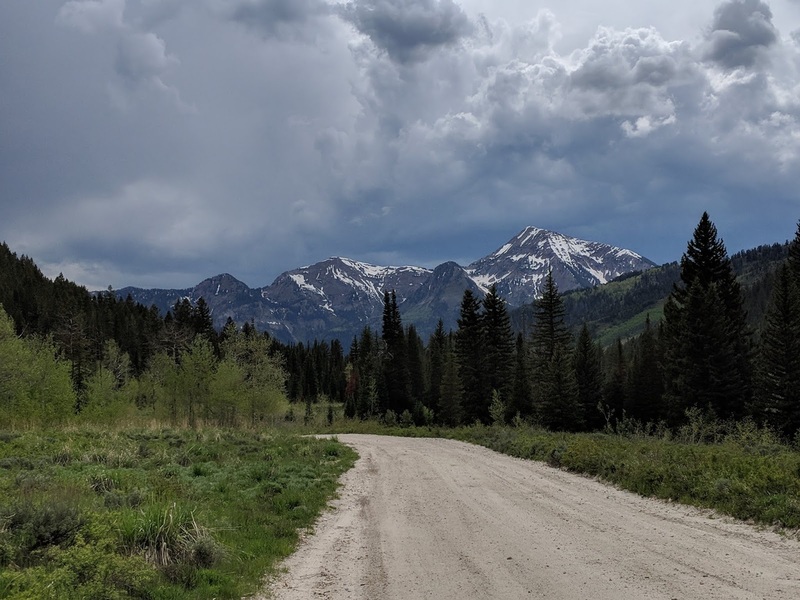 Beat was going to fly into Salt Lake on Thursday to run the Bryce 100 this weekend, so I opted to come up a few days early rather than drive all the way to Boulder and back. I'd hoped to squeeze in a hike with my dad, but he took a bad tumble on Mount Olympus last week. It was a freak incident that happened just 10 minutes from the trailhead upon return. He doesn't remember what caused the fall, but his friend turned around to see him tumbling down the rocky slope. Dad was unconscious for three minutes before he came to. With help from his friend, he was able to walk out with numerous head wounds, a concussion, a broken wrist, bruised ribs, and bruised legs. The photo he texted me was gruesome. Happily he will make a full recovery, although he's bummed about four to six weeks of a broken wrist during the height of hiking season. Since I had a bike with me, I took a more rare opportunity to ride in the Wasatch Mountains. 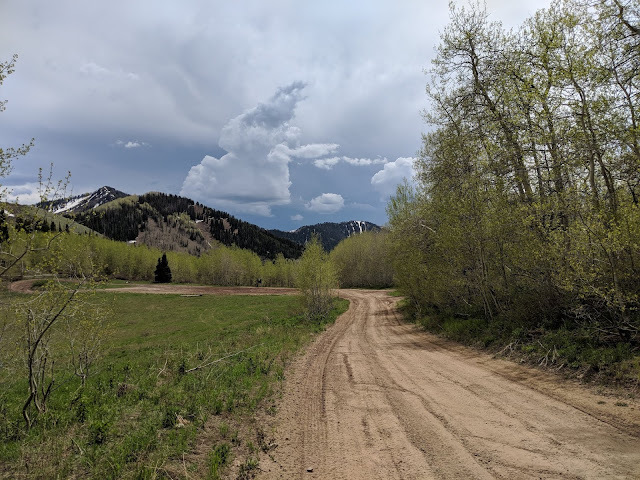 On Wednesday I decided to ride the trails over South Mountain and climb American Fork Canyon as far as I could muster ... I'd never been up that way, not even to Tibble Fork Reservoir, in all my years as a Utahn. This is a beautiful climb. It was another hot day — 86 degrees — so I packed all the water and all of my rain gear. There were thunderstorms everywhere, but they all managed to miss me. Figures. Grind, grind, grind, from 4,500 feet all the way to 9,000. I enjoyed the verdant green baby aspen leaves and fast-flowing creeks. Traffic was light, but at one point I was passed by two men on four-wheelers who wanted to chat and had lots of questions. Nice guys, really, but I was working a 15-percent grade on loose gravel, and not up for wasting my wind on words. I tried to be polite as I gasped out answers, and they continued on their way. When I reached the top about a half hour later, they were beside themselves. "We just got here, too!" one exclaimed. "Did you really pedal that whole hill? All the way from Tibble Fork? That must be ten miles! Better turn around here. Over this knoll, the road goes way, way down. I don't think you want to climb two mountains today." 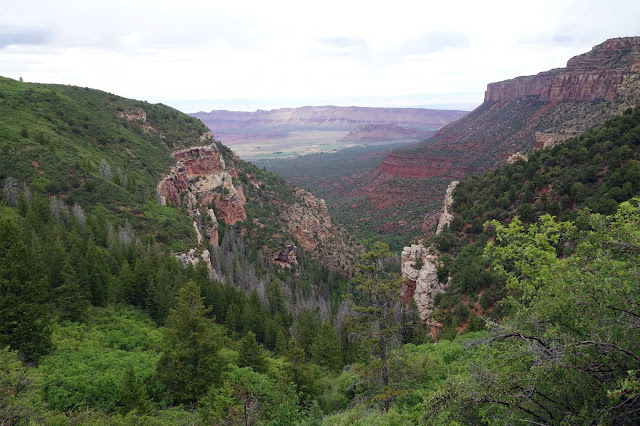 I still rode over that knoll, just to see the other side — Heber Valley. Next time, I will ride that descent and find another awesome climb to return home. 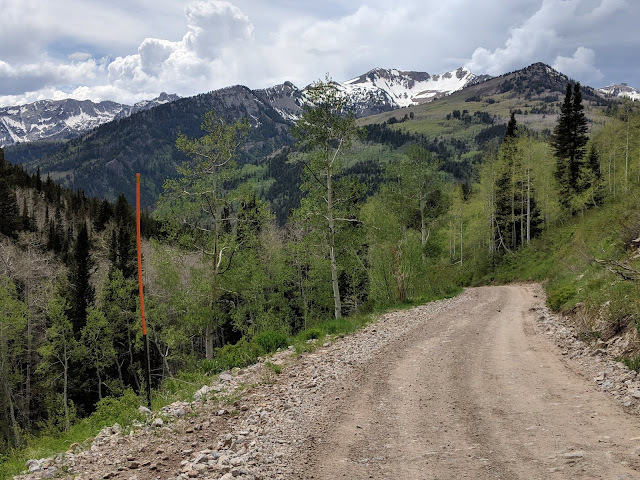 I also took some time to briefly explore the ridge trail, but it was a rough moto trail — deep moon dust and fall-line grading. (I don't know if motorcycles are allowed on these trails. They definitely use them, based on tracks in the dust.) It was one of those trails where I'd be much happier without a bike. Still, I vowed to explore the singletrack next time, too. The nostalgia trip was complete that evening when I visited my best friend from high school and met her wiggly pack of 4-week-old whippet puppies ... so adorable. Of course when we get to talking, it's about skipping school and playing in sand dunes that have been buried under reservoir water for nearly 20 years already. Somehow, regardless of the timeline, you just pick up from the start without missing a beat. It's a uniquely cathartic experience, spending time with the people you knew when you were young. Life's relentless forward motion slows down for a moment, allowing space for a wealth of memories to encompass us. It's a welcome reminder that yes — we've lived. Box Canyon Mark from Lovely Ouray. I don't get to see my Idaho friends very often but I feel the same way. They know the true me, if that makes sense. Few people do.